Amoeba was invented by Masahiro Nakajima, the Curator of The Museum of Abstract Strategy Games, in 2010. It is an all-out strategy game following FlipFlop (English), RinneTensei (English), The Ring World (English), which won the "Award of Excellence" in the 7th Original Game Competition of the Game Amusement Society in 2009, also created by Masahiro Nakajima. The online version of this game is available on Amoeba Online. This game has been published by Nestor Games from 2014. The author wanted to realize the movement of Zergs (spooky aliens featuring bugs, which appear in his favorite real time strategy game StarCraft) in an abstract strategy game. Amoeba's characteristic game rule, the strength and the function of pieces change with "form" and "split", was inspired by funny movements of Zergs. Each player has ten standard pieces and one Kernel piece, which are initially placed as the photo on the right on a hex board (See left.). Players take turns to move a piece of their own color. No pass is allowed. Stacked pieces are called "stacks". Single pieces can also be called "stacks" as single pieces can also be considered as single-layered stacks. The player who controls the stack is the one who can move the stack. Stacks are controlled by the player who plays the color on the top of them, no matter how many pieces or what colors of pieces are in the stacks. Stacks are moved from points to points along the lines on the board. Stacks move all together. Move the same number of points as the number of the pieces that compose the stack: Single-layered stacks move one point, and 3-layered stacks move exactly three points, but not less. If there are other stacks in its way to the arriving point, jump them over.If there is another stack on its arriving point, stack the moving stack on the top of it. Split the stacks as they move. Three-layered stacks are always split into three, and five-layered ones into five likewise. Leave the bottom piece on the first adjacent point, and then the next to the bottom one on the second point in turn until the last(=top) one. If there are other stacks on the points in its way, place the split piece on the top of them. Moves are restricted to directly straight, no change of direction allowed. Accordingly, a move that requires more number of points than the ones in a straight-line on the board towards the direction cannot be made. Kernel move exactly as other pieces. Kernel'' do not have to be on the top of stacks. The game is won by the player who first controls the stack with the enemy Kernel or who takes all the legitimate moves away from the other player wins. When the same situation appears more than three times, or it turns out that neither player can control the other's Kernel, the player who controls the more stacks wins. When a player offers the end game in her/his turn, if the other accepts it, the controlled stacks by both ends are counted at that time. The game ends in a draw when two players have the same number of stacks. Alignment sequence of pieces in stacks is very important as it decides which piece goes to which point when the stacks are split. Too high a stack has a drawback: The higher the stack gets, the fewer directions it can move to. It is effective to make your opponents' stacks (Attack ones with zero or a limited number of your pieces!) higher. How you approach to the opponent's Kernel, how you fend off "Checks"... There are several tactical moves. With a split, the stack's mobility may be totally improved. Learning those basics can give you an edge. Come-from-behind wins easily happen even when most of the stacks on the board are controlled by one player. Chasing up the Kernel tend not to be a good move. It is rather effective to encompass the Kernel in order to track it down. Also, it is a good strategy to try to control as many stacks as possible: That would leave less legitimate moves for your opponent. Amoeba is receiving high evaluations from test players including women testers. In the test play, many people became very much absorbed in the game within a few minutes. The game is highly strategic, despite the simplicity of its rules. Copyright © Masahiro Nakajima 2010, www.nakajim.net 2010, All rights reserved. Printable Hex board is available here. 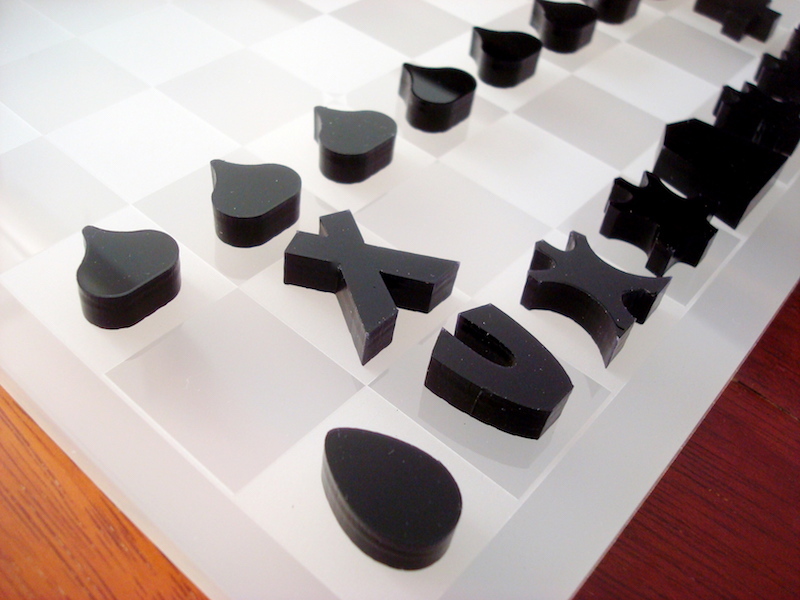 Coins can be used for pieces for example with the board.